Apple Watch’s watchOS features a user-interface that is very similar to iOS, yet there are certain elements that make the operating system of the wearable device unique. The watch has different looking notifications that show the app’s icon, a title and then the preview of the notification’s content. The new WatchNotifications tweak brings the same look of Apple Watch notifications to iOS devices. 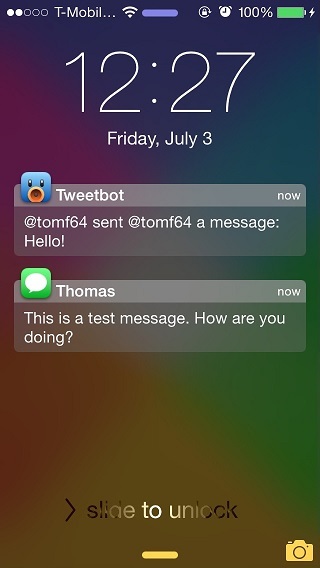 The new notifications appear on the lockscreen, replacing the plain old notification banners of iOS. While WatchNotifications only brings a visual change to the lockscreen notifications, it is a change that is very noticeable. It not only makes the alerts interesting but also gives a fresh look to the iPhone’s lockscreen. The tweak adds a settings panel on the device, however there’s nothing much you can do there. Settings contain a kill switch and an option for users to enable or disable the app icon shadows. We hope the next updates will offer some customization options for the users allowing us to change the appearance of the notifications by changing colors, font size among other things. But for now we are happy with the stock watchOS look. WatchNotifications tweak is available in Cydia for $1. It works on all devices running iOS 8 or above.